Who is the guy talking? Postgresql is slow after about 2 million operations. Curious case of Amazon CPU credits, I/O Burst credits. - Responsible for systems going down but never responsible for them being staying up. And why is it challenging? It’s part of your application lifecycle that doesn’t get covered in sprints, Agile, Scrum, etc. Something went Wrong. Something is not working. Something is slow. No self written code. Everything that we’re debugging, is actually part of some libraries, some kernel code or some developer written code. But we don’t have luxury to do print statements. Figure it all out when the house is on fire. You’ve 5 minutes!! The scope of this talk is only about observability tools. Benchmarking, Tuning, Static config check tools are for some other day. I know few things. I’ll try to look only in those areas. Staring at code until bug reveals itself. Increase CPU, IOPS, Memory.. restart the service. It works! When you’ve lot of connected components, you just go from app layer, database layer, network is bad, it’s raining at our data center in US. This is something I follow reluctantly. If I’ve 100 different metrics on a server, which all dashboards do I look, before concluding anything? Any of these methods might work sometimes, but don’t make it a practice. Hey, my application is running slow. Why? Hey, my machines are at 100% cpu usage.. can you add more CPU cores? OMG! I’ve an out-of-memory error. Add more RAM!! It was working fine in staging, was working good under load testing. We were able to handle higher loads than this, why is this happening now? Lets you look at what’s your program is doing, without knowing anything about source. It prints out every system call made by your process. Do not run on production. Missing library. 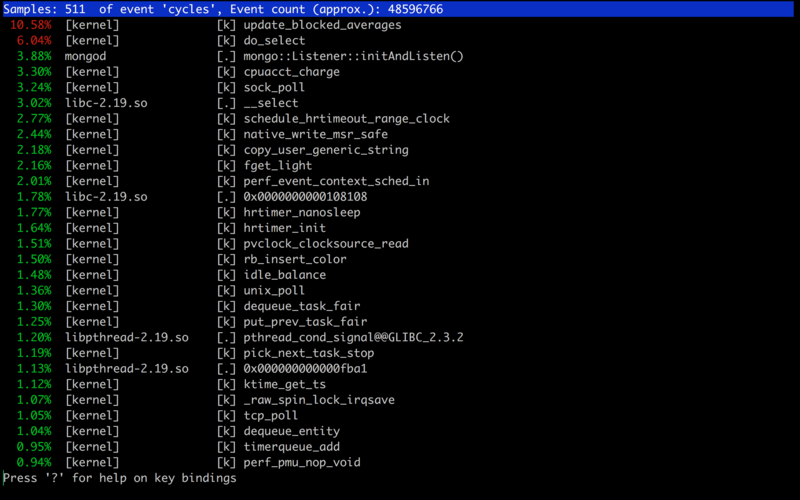 A python app called Sentry, a beautiful open source real time error tracker. Now, we’ve installed it in virtualenv and something is wrong. I did strace -e trace=open,read <pid> and foudn out that one of the libraries is being loaded from somewhere other than my env folder. Which network components is it connecting to? 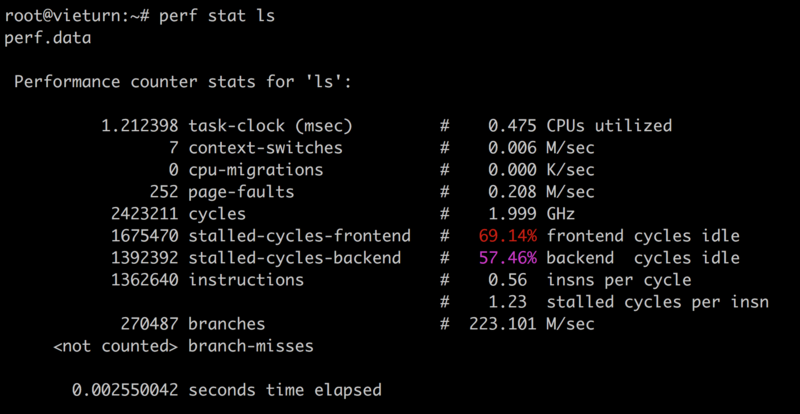 Strace linux standard uptime and find out where is it getting data from! It prints out how much network and disk every second. Mysql is intermittently slow. Sniffing network packets, and monitoring for a while, can tell you what’s happening. In one scenario, recv has jumped to 455MB and mysql went slow. So, it’s a query! Now, we’ve a lead.. We can inspect further. top is the first guy we look at. Problem: Shortlived processes aren’t covered in top/htop..
atop got your back, though. It prints out short lived processes too. Fun exercise: Strace all these tools! However, these tools can only go till process level. What if I have a tool which tells me which function in my program is using most of the CPU? perf is an amazing tool! Does a lot! It’s a sampling profiler. Flame Graphs are interesting way to look at perf reports. Because perf reports can be long! opensnoop traces open() syscalls, showing the file name and returned file descriptor. Isn’t this same as strace -e open?? Yes. However, strace freezes every system call, prints it to output, unfreezes it. While opensnoop does it without freezing system calls. Fun Stuff to do:How do we know this? strace strace, strace opensnoop Reading source code should help you better. Till date, I found it useful only for this, in debugging. Print network connections, routing tables, interface statistics, etc. I use it mostly to find out how many connections from each host are there currently on my server. It’s simple to use! netstat -tunapl and grep desired stuff. Something like this is helpful one-liner. Tells what files are opened by what processes. df -h shows 100% disk usage. du -sh / tells other tale. Is linux lying? Not actually. lsof +L1 tells that you’ve few files , but your filesystem has a pointer to it. So, it’s part of filesystem space. How to reclaim? Restart process, to release deleted files. Widely, we’ve these tools doing either of sampling profilers, trace system calls. Somewhat unpopular and difficult to articulate. Too specific and requires some knowledge about linux kernel. - ltrace (trace library calls of the function), ss (socket inspection tool), ethtool, blktrace (traces of i/o traffic on block devices), slabtop, tiptop, pcstat and many more! Fun and Important Stuff: Which one is used by your monitoring system? Nagios, Sensu, Newrelic, Datadog, etc.. somehow use the same underlying functions. We’ve seen a lot of tools above. If you strace them all, you’ll find they’re opening /proc/ at one point or the other time. All the treasures are hidden here! /proc/ is a directory in linux where all of your processes stay. It has some folders under the hood. What I’d be most interested, in general, are limits and status. Sometimes, filedescriptors! We’ve our hosted gitlab server and it’s painfully slow for a few days. Updated gitlab version a few days earlier, but is it really the reason? Found out ssh is slow. Turned on strace on sshd, on server during off work hours. Found out some obscure library call on systemd taking too long. Googled it around, and boom! There’s a linux patch yet to be merged. Lived with workaround for a couple of days, applied patch and everyone is happy! Finding out this, would’ve been practically impossible with our basic tools like top, iotop, etc. An obscure postgresql server that’s running painfully slow, after about 2 million operations. Usual suspects like CPU, RAM are calm. We restart the system (not just service! ), and it works fine for 2 million more operations. Now, as it is production, we can’t run strace. Did some random unrelated tunings and expected it to work, it obviously doesn’t. Finally did perf top and bunch of other things to find out something is awry with L1 cache. Yet to be debugged to the root level. I’m poor in networking! I’m sure it’s not difficult. I might have to do some tcpdump or so. We run out of them, quickly. And while we can have alerts to do some actions when they go out of credits, I was more keen on how the usage has been. To scale right in production, is a myth. We got to do everything related to profiling before hand, understand what resources my program is using, etc. and decide on what instance type, capacity to allocate. Some of these might not be applicable for docker. I tried to run strace inside a container for the first time, and it said permission denied. I’m gonna figure out why and update here.